Brooklyn-based Dust Busters with John Cohen and local heroes Kleptograss join forces for a string band double bill to be reckoned with! Ballads, fiddle tunes, jug-band blues, and flat-out fun: it's all a part of a performance by old time string band, The Dust Busters. The band integrates a wide range of music into each performance, conjuring a freewheeling energy reminiscent of early string bands such as The Skillet Lickers and The Mississippi Sheiks. Inspirations and influences abound, drawn from the direct fusion of Scots-Irish and African music set in Appalachia, the Western states and Deep South, from the earliest colonial times through the Second World War. Weaving these into a distinct sound with authenticity and creativity, The Dust Busters make it thoroughly contemporary, meaningful, raw...and foremost, fun. 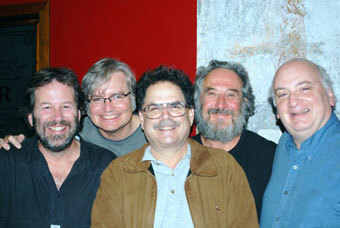 For tonight's show, the group is joined by folk legend, musicologist, and filmmaker, John Cohen. 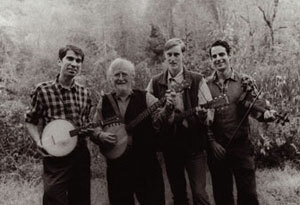 John was a founding member of The New Lost City Ramblers, one of the most enduring and influential old time string bands that formed in New York City during the 1950s Folk Revival. One of the most important "discoverers" of traditional musicians and singers, John is also credited with finding and recording numerous old time musicians of Appalachia. Pioneer Bay Area flatpicker Eric Thompson is the ringleader of the band of musical gypsies known as Kleptograss, known for painting a passionate pastiche of tune and timbre viewed through bluegrass-tinted glasses. Borrowing freely from any musical style that grabs his ear, Eric plunders the mountain musics of Appalachia and Puerto Rico, the insular sounds of Ireland and Greece, some funky jug-band blues, plus both French and Western Swing, joined by the "crème de la crème" of the local acoustic scene. Tonight's all-star lineup features the scintillating Scott Nygaard on guitar, bashful wit Paul Shelasky on fiddle, string wizard Jody Stecher on mandolin and banjo, and powerhouse Paul Knight on bass. At 7:30 pm we will screen John Cohen's award winning short documentary film, Roscoe Holcomb: From Daisy, Kentucky.